As an eleven year-old, Don Antonio was slated to succeed his father as the next Grand Duke of Tuscany, but that situation changed quickly. In the autumn of 1587 the young prince lost both of his parents in the space of a few days. They both fell extremely ill and died within a short time of each other. Rumors flew that Francesco de' Neri and Bianca Capello had been poisoned, but forensic investigators have since found pernicious malaria pathogens in Francesco’s remains, a disease with symptoms consistent with the reports of physicians on the scene. Historians trace their infection to an outing in the damp forest a few days earlier, where they had probably been bitten by mosquitoes carrying the disease. The boy’s uncle, Cardinal Ferdinando took charge, consolidated power and excluded Don Antonio from the royal succession, although he was given a prominent place at court as a diplomat. As part of a deal that he would never marry, he was allowed to keep the title of Prince of Capestrano, to which was added Grand Prior of Pisa, in the Knights of Malta. The agreement also gave him possession of the laboratory facility that his father had built s well as several other properties. 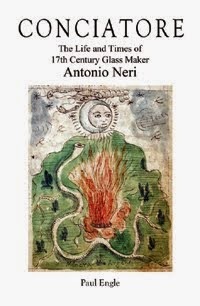 That laboratory on the north side of Florence, the Casino di San Marco would become the prince’s residence and the place where Antonio Neri would learn about glass formulation. Although never allowed to marry, over his lifetime Don Antonio managed to have a number of children; his last three sons were ultimately legitimized by the pope as Medici heirs. In the end, it was the slow, progressive ravages of his disease that brought him down. He died in 1621, at the age of forty-five, unable to leave his bed. He was given a proper funeral, and interred at the Medici chapel of princes in Florence.